We can produce various different kinds of shop signage from vinyl cut lettering for windows to full colour weather-resistant external boards. We usespecial inks to resist degradation from sunlight which can change the hue of certain colours. A smart exterior sign can do more than simply tell visitors they have arrived at the right place. Your external signage speaks volumes about the quality ofyour business and is also an opportunity to advertise your products and services and attract passing customers. A tatty or faded sign says "We don't careabout our business." Do you want to give this impression? 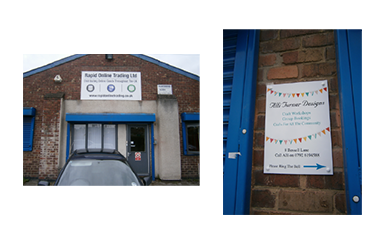 We advise professional installation of our signage to ensure that it will look its best and stay in place. We have installers nationally so don't worry ifyou are not in Nottingham. For a quote to update, print and install your signage and smarten up your business, call Nottingham based AGC or email us and we'll get right back to you.